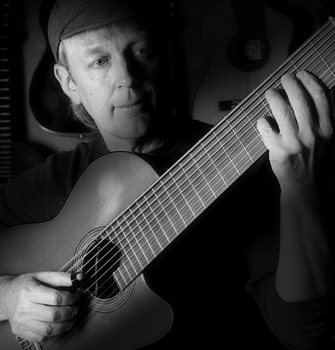 Bruce Dunlap is considered a virtuoso on the guitar and as a composer, whose uniquely complex compositions place him among America's top jazz musicians. Bruce Dunlap is considered a virtuoso on the guitar and as a composer, whose uniquely complex compositions place him among America's top jazz musicians. "His compositions are sometimes beyond the capacity of the traditional guitar, since he integrates notes that are outside of the range of the instrument," said nominator Stuart Ashman, the executive director and chief curator of Center for Contemporary Arts in Santa Fe. "To resolve this and achieve his creative efforts, Bruce works with Santa Fe luthier Keith Vizcarra to design and fabricate instruments that can accommodate his compositions, sometimes adding two and three more strings to extend the range of the guitar. The resulting music is as complex and textural as pieces composed for piano or other full range instruments." Alan Arkin called Dunlap "one of the finest musicians I have ever encountered in my entire life." Dunlap, who has lived in Santa Fe for more than 34 years, was raised in a musical family. His father was a frequent conductor for the Detroit Symphony Orchestra and his sister was an accomplished pianist. Dunlap took up the guitar at age 3 to show his sister what she was doing wrong. This obsession with the guitar later led him to practice up to eight hours a day, something he continues today, some 56 years later. In his career as a professional musician, Dunlap has played and recorded with major international jazz figures including Kenny Werner, Bob James, Fred Hersch, and Herbie Mann. He has recorded numerous solo albums, all of which have received wide acclaim, and he has performed in such prestigious venues as Carnegie Hall, Lincoln Center, the Hollywood Bowl and the Dorothy Chandler Pavilion. "I can say without hesitation that I have not encountered a musician with the level of talent and virtuosity as Bruce Dunlap," said Ashman, a former Department of Cultural Affairs Cabinet Secretary. Dunlap is also committed to making music accessible to all. In 2000, Dunlap founded the Santa Fe Jazz & International Music Festival, which over the next five years presented hundreds of internationally renowned jazz and world music artists, who also provided free workshops for thousands of Santa Fe students. "Bruce's festival brought many of the world's greatest jazz performing and recording artists to Santa Fe," said Lee Berk, retired president of the Berklee College of Music in Boston and former chair of the New Mexico Music Commission. In 2005, Dunlap established the nonprofit GiG Performance Space, which has presented over 1,200 concerts featuring musicians from over 30 countries. Dunlap is also a devoted teacher of music. "His feeling is that music is in the air and you can take as much or as little of it as you wish, and he recognizes that everyone has some measure of musical talent that can and should be expressed," Ashman said. Pianist and composer Dave Grusin said Dunlap's own knowledge and consuming interest "has become his gift to all of us, by exposing us to the kind of musical experience most of us wouldn't be able to find on our own."